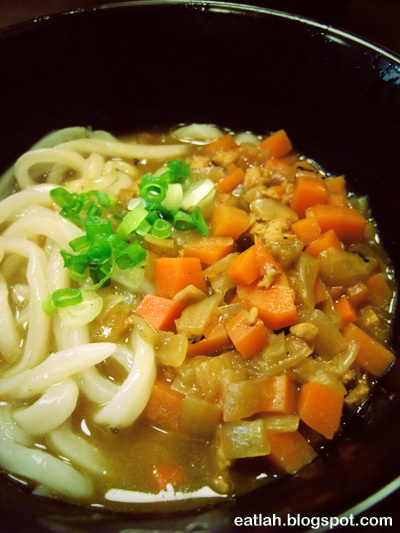 Sanuki Udon @ Taman Bukit Desa, KL | where and what to eat lah? Udon has for centuries been one of the favorite foods of the Japanese. 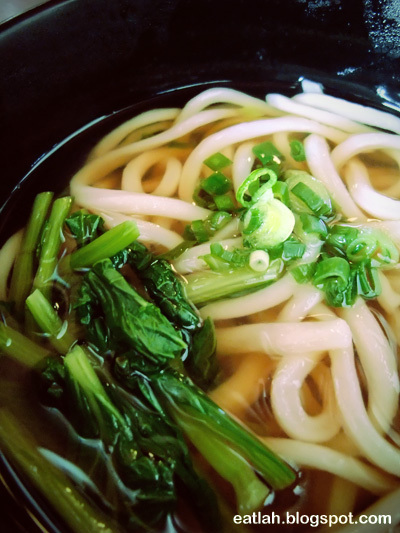 Sanuki udon is a traditional product of Kagawa Prefecture (known as Sanuki in the ancient time), legend has it that Sanuki udon was first brought to the region from China in the ninth century by the famed monk Kukai. 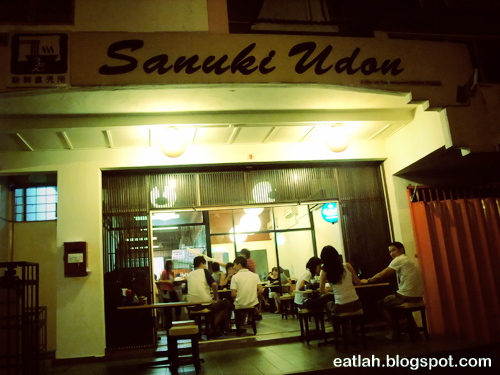 Now, you can have a taste of Sanuki udon located in Taman Bukit Desa, well hidden within a quiet neighborhood. The owner, Mr. Seiji Fukimoto make his own fresh udon in the shop daily. Original soup udon (RM 5) with chopped scallions and choy-sum (?? ?...added maybe to suit the Malaysian palate). So, what's so special about Sanuki udon? It's the texture of the noodles, which have a soft and silky feel combined with an al-dente firmness, and the way they are complemented perfectly by the lightly seasoned bonito-kelp (dashi) based soup in which they are served. Well-worth the price for a good bowl of fresh hand-made udon like this! 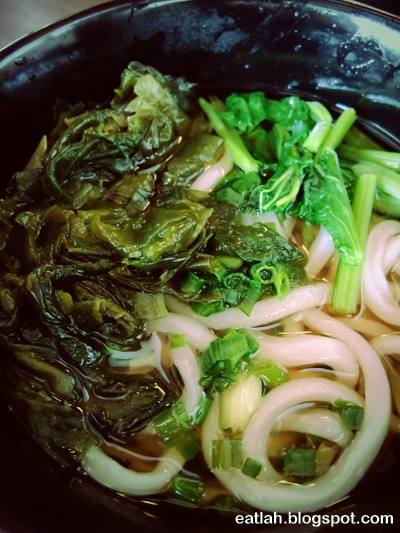 Original soup udon with wakame (seaweed) (RM 6). Here, there are 7 serving styles of udon along with some toppings (priced between RM 1-2) like egg, wakame, kakiage (deep fried mixed vegetables), kitsune (sweetened tofu) and ebi tempura (disappointing deep fried prawn), all in a simple single page menu. 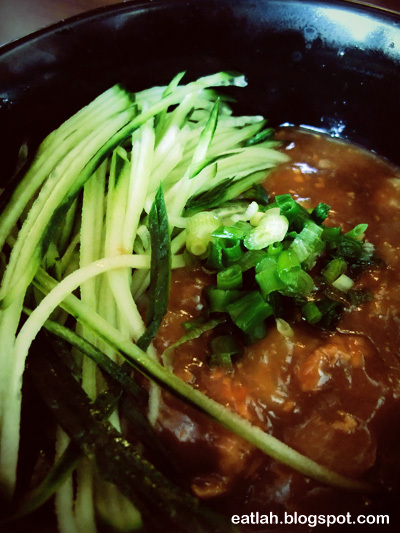 Dry cha-cheong style udon (RM 6), served with cha-cheong sauce, sliced cucumbers and topped with chopped scallions. Well, not very Japanese, not very Taiwanese and not very Malaysian either, maybe somewhere in between, definitely not my type of cha-cheong sauce - it was too starchy. Japanese curry udon (RM 7), with well-cooked small cubes of potatoes, carrots and chicken meat. The Japanese curry was a little diluted for my Malaysian tongue, considering others Japanese curry udon (Sushi Zanmai, Sushi Tei, even Sushi King, etc.) that have a stronger curry fragrant in it. 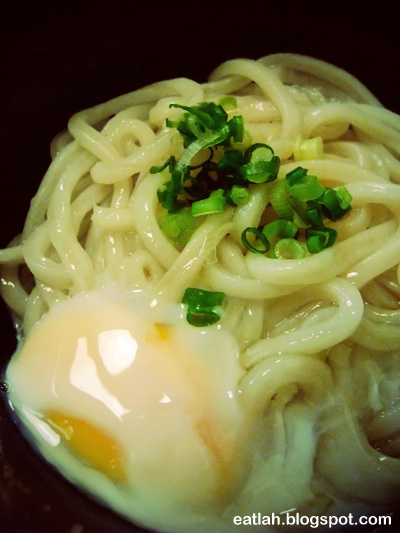 House special udon with egg (RM 5), lightly flavored with sesame seed oil and topped with chopped scallions. Indeed, it was very simple, plain and light. On the menu there are also few side dishes that you can choose from. 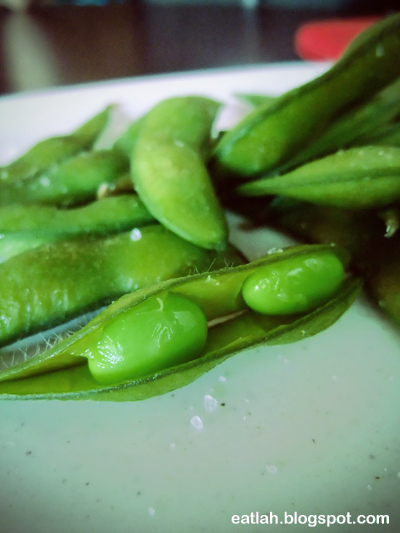 One of it, edamame (green soy beans) (RM 3) with lightly salted. 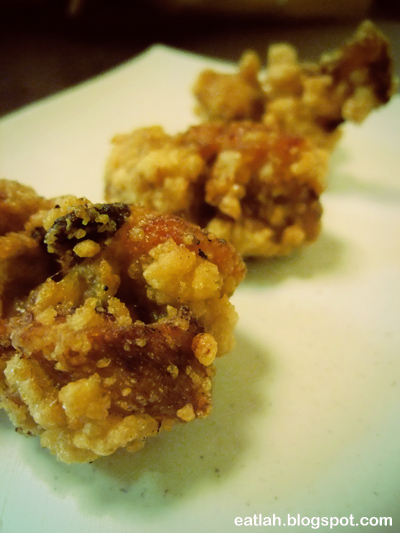 Karaage (deep fried marinated small chicken cutlets) (RM 3), chunks of boneless chicken meat lightly battered and deep fried till piping hot tender and juicy. If only they served it with my favorite Japanese Kewpie mayonnaise, it'll be perfect. 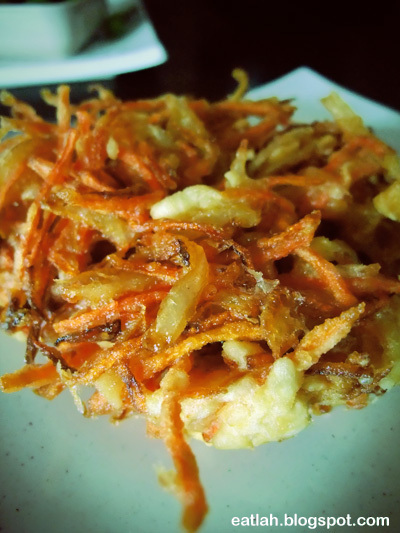 Kakiage (deep fried mixed vegetables) (RM 2), rather plain with a slight sweetness from the vegetables. 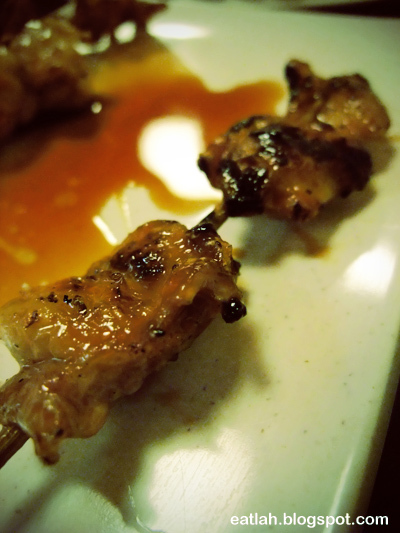 Only after 5:30pm, they serve yakitori (grilled skewered chickens) from RM 2-3 per stick with different chicken parts like skin, gizzard, liver, heart, leg meat and bishop nose. 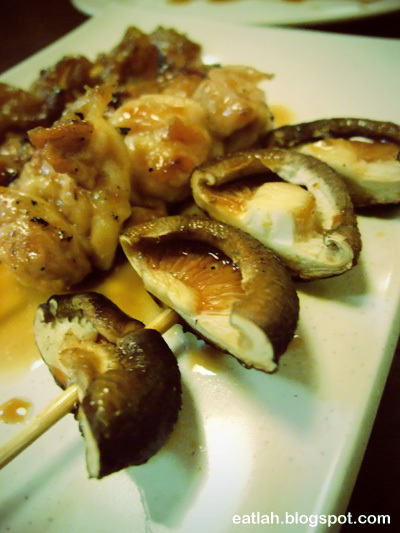 Shiitake mushroom (RM 2) yakitori, small but flavorful. 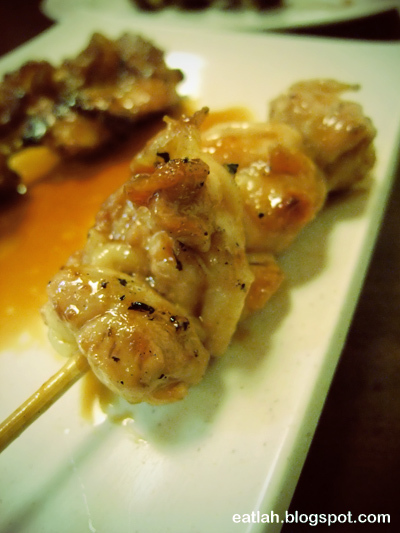 Momo (leg meat) yakitori (RM 3), tender juicy chunks of boneless chicken leg meat. 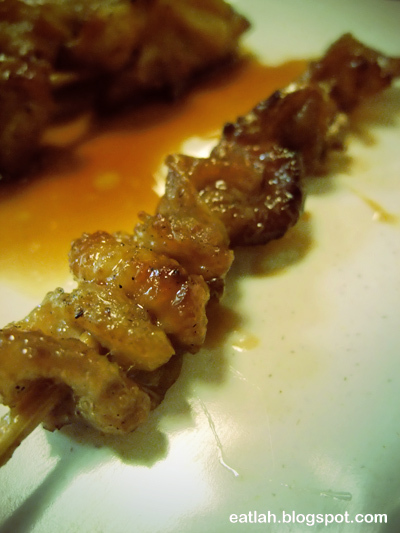 Kawa (skin) yakitori (RM 2), fattening stuffs. Bonjiri (bishop nose, the polite way of referring chicken backside) yakitori (RM 2), this is probably the best variations from their list of yakitori. It was scandalously smooth and juicy. Verdict: Overall, it was worthwhile. Reasonable pricing with generous portion of udon. Original soup based udon (maybe with added toppings like wakame and an egg) is probably the best among all. Sometimes, the simplest things are the best and often the hardest to perfect. eh eh..wanted to go this place few days ago, then my collleague suddenly change place..
i am Japanese, i live in bunko at yokohama. When i visit KL last week,I went to sanuki udon. good tast. i am japanaese, when i visit KL last week. i had sanuki udon. good tast. I visit KL last week, went sanuki udon, good tast. Hello we plan to visit KL next week. How do I travel from seputeh komuter station to sanuki udon. can we walk or take bus?